Bruise Defense™ Soothing Cream helps promote the appearance of healthy skin and faster healing from bruising due to certain types of medication, surgical procedures or simple skin trauma. This concentrated cream contains essential botanicals, Arnica, AP4® Aloe Vera Complex and MSM to help provide soothing relief. Arnica Montana Flower Extract is a botanical believed to help with bruising and MSM is designed for soothing relief. We use this product on my 90yo Mom's fragile skin and bruises - we've found that it is much better than other similar products.. 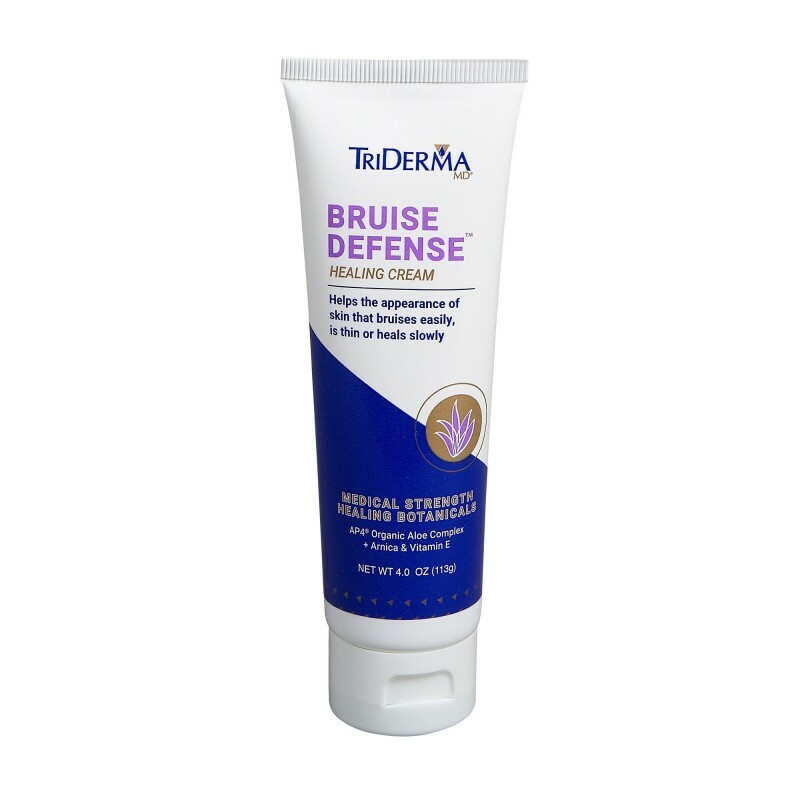 I've been using TriDerma Bruise Defense healing cream for a year and I'm very pleased with the way it helps to speed up the healing process of the bruises I get from playing with my dogs and just doing day-to-day activities. Since I started taking a blood thinner I have bruised much more easily! My skin is fair, thin and sensitive. TriDerma is an excellent cream that helps my skin heal. This product actually works great would buy it again. I had a scabbed, bruised area for weeks that would not heal. After trying every product in my usual arsenal, I tried a sample that I had of your diabetic (not my issue) bruise healing cream. I WOULD DO COMMERCIALS FOR THIS PRODUCT! I had visible results almost immediately. It has been a tremendous help for my mother's bruises cause from the multiple IVs. Apply generously to bruised or injured skin as soon as possible. Repeat several times a day. May also be used daily to help maintain healthy skin. Safe to use on sensitive skin. aloe barbadensis (aloe) leaf juice*, dimethyl sulfone, arnica montana (flower) extract, isopropyl palmitate, caprylic/capric triglycerides, cetearyl alcohol, polysorbate 60, beeswax, tocopheryl acetate (vitamin E), C12-C15 alkyl benzoate, allantoin, behentrimonium chloride, cyclopentasiloxane, cyclohexasiloxane, hydroxyethylcellulose, sodium hydroxide, phenoxyethanol, ethylhexylglycerin. "This product is amazing for healing bruises and not just for diabetics. My husband brusises easily after chemo and this product really accelerates his healing."